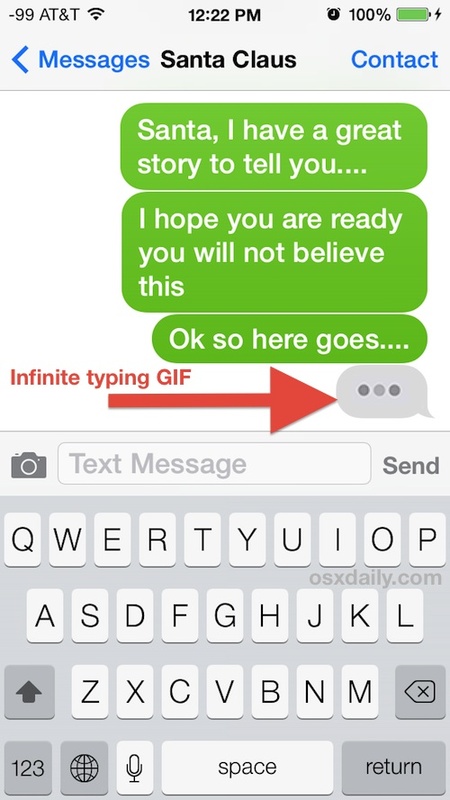 Now that the iMessage protocol supports animated gifs, you can play an incredibly stupid prank on your friends by sending them this amusing animated image of the infamous “typing” animation that plays when the person on the other end of an iMessage conversation is in the midst of a reply. The result; it looks like you are typing for 200 years, possibly an eternity, as the recipient waits ever impatiently for a reply. This little trick comes from the appropriately named site “Miscellaneous Mischief“, and though it made the rounds about a month ago, I wasn’t convinced it would work until someone played the prank on me today… so if I fell for it, then I’m sure other iPhone and iPad users will too. Give it a try, it’s good fun. It works for OS X too, but if you really want to play a (terribly horrible no good) prank on a Mac user, give them a fake kernel panic with this. To a different website, copy And paste. Haha this is awesome! All my friends fall for it! can you make the latest FB typing gif I want to prank someone. . . . . It is an animated GIF, it works. Sorry your prank didn’t work out though. Does it work on iPad mini?